How is it that finishing something leads to starting something? I finished a good read in the wee hours of the morning and that started a wonderful discussion with some treasured friends. When a person finishes reading someone's story, its starts a new part in the reader's life by being interwoven into their own story. I am shaped and moved in directions that I would not be otherwise drawn toward had it not been for another's story. 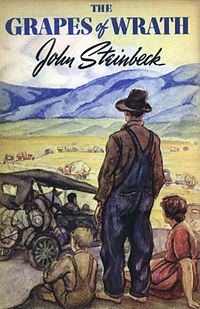 Vickie Dyck: A good writer lets you see thru someone else's eyes --- and once you've seen life thru someone else's eyes their truth becomes your truth as well --- Mr John Steinbeck is VERY good at helping you see life thru someone else's eyes -- Well done, Mr Steinbeck!